I love this Anne Touraine Paris silk Twilly tied to my bag! I’m having a Babe Paley moment with my Marc by Marc Jacobs Globetrotter Mini Rei bag tied with a purple silk Twilly by Anne Touraine Paris. Anne was kind enough to send this to me as a gift and I immediately loved the vivid color of the silk, as well as the angled edges, and I knew it would look perfect tied to my Marc Jacobs bag! Babe Paley in a Norman Norell dress. Photo by Slim Aarons, 1946. No scarf but look at the pearls! 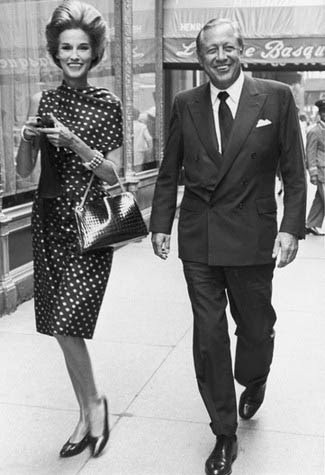 Babe & Bill in 1965. Is the scarf in her hands about to go on her bag? From WWD. 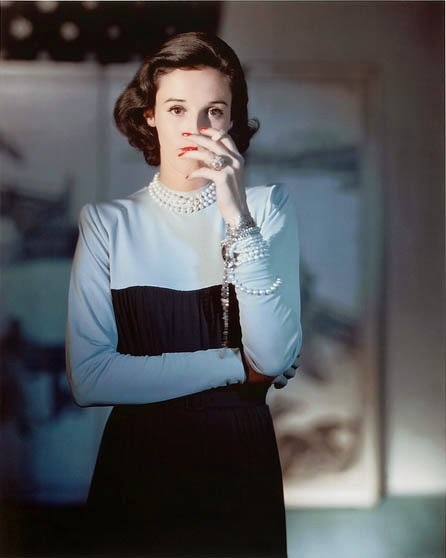 It is said that Babe Paley, socialite and wife of William S. Paley (who was the founder of CBS), and, arguably, favorite swan of Truman Capote, was once photographed with a scarf tied to her bag and soon everyone copied the look. I don’t see this so much anymore in Brooklyn or Manhattan—and I could not come up with one picture of Babe herself with a scarf on her bag so maybe it’s just a myth, but I am happy to get this look started once again and this Twilly kicks off the scarf-and-bag party in high style! Twilly, Anne Touraine Paris. Bag, Marc by Marc Jacobs. Sunglasses, L’Wren Scott. I love the color of the Twilly next to this Zoya polish in Riley. I have written of my love of Twillys before. They are perfect not only tied to a bag but around the wrist as a bracelet or around the neck, paired with a simple pendant necklace, as a kind of borrowed-from-the-boys necktie. Anne’s site offers some nice ones, in both solid color and print, and they are worth a look. Twillys are a great way to freshen up a fall wardrobe with a pop of color without spending too much cash! This is the purple Twilly, called Nice, from Anne’s site, but you can see that in this particular lighting it seems a very deep blue, nearly violet. I love it! 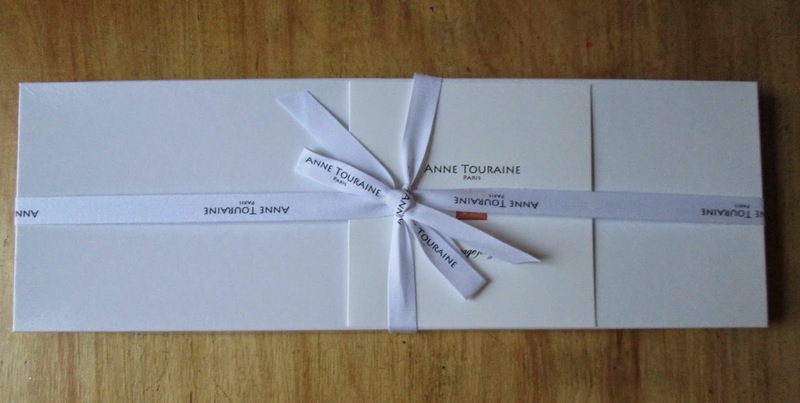 Each Anne Touraine Paris Twilly comes in this elegant box! Do you ever tie your scarf to your bag like Babe Paley? Or me? Disclosure: Anne Touraine Paris sent me this silk Twilly as a gift. As usual, all opinions expressed here are my own. SUCH A PRETTY COLOUR and yes I do tie scarfs to my bags occasionally. The color is gorgeous...beautiful scarf as all of hers are! I love it on the handbag! Stunning color. I love Twilly scarves - they are so fun and feminine. And Anne's scarves are such superior quality! Lucky you!